Here we see a team of four abreast with a carriage that pushes a team of two horses with their driver aside into a ditch. The driver of the four has crossed a bridge in a galop, not taking into account that an oncoming wagon needs space to dodge. The driver of the four does not care about the other driver, a scene that is recognizable in modern traffic. Apart from this observation the way the four horses have been harnessed is very interesting. It is the style of the classic Roman quadriga, here applied in 19th century rural Poland. The wagon on the left has a peculiar construction: a pole between the axles extends on the back, and the sideboards have been reinforced with two short poles on each side connected with the extending axles. The wagon carries a big barrel packed in straw. Everything in the most simple way. Four men ride in the wagon on the right, one of them holds a gun. The bridles have bells and the harness has other decorations. The horses show all different colors: a skewbald, a black and two bays. The team of two consists of a grey and a chestnut. 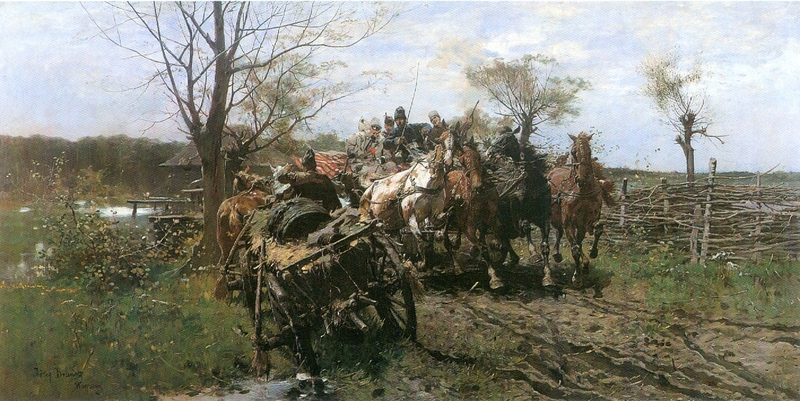 The Polish painter Józef Brandt (1841-1915), educated at the Akademie der Bildende Künste in Munich, had much atttention for the details of the wagons, the horses, the riders and the scenery. See also the braided hedge on the right.